Funky's Fly 'n' Buy is Funky Kong's business in Donkey Kong Country: Tropical Freeze. 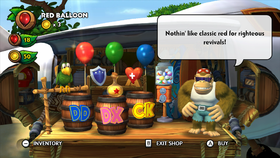 It appears to be the successor to Cranky Kong's Shop from Donkey Kong Country Returns since Cranky is now a playable character. Funky has a shop in each of the game's worlds (except for the unlockable Secret Seclusion), although each of them carry the same selection of items and they are also at the same prices. Many useful goodies and toys can be purchased at these shops in exchange for Banana Coins, although none of the items are mandatory to complete the game. In the game's Nintendo Switch port, Funky's Fly 'n' Buy is run by a parrot named Tawks while the player is playing as Funky Kong. Along with these items, Funky Kong also sells toy figurines. These can be bought with five Banana Coins each by selecting the Capsule Toy Machine. x3 Grants one extra Balloon. x7 Saves you once from a fall. x5 Refills your air meter if it runs out..
x15 Adds one Extra Heart to your Heart Count. x10 Squawks helps you find Puzzle Pieces. x15 Makes you temporarily invincible! x10 Protects your Mine Cart or Rocket Barrel from damage once. x15 Gives you Diddy, Dixie or Cranky. The following gallery shows instances of Funky's Fly 'n' Buy throughout all of the game's worlds, except for Secret Seclusion where the shop is unavailable. The name of the world is noted underneath each image, followed in parentheses by the shop's numbering code (where "S" stands for "shop"). The numbering code is only displayed on the save file when the player quits the game immediately after visiting the shop in a world. Also presented among these images is the concept artwork of Funky's Fly 'n' Buy, which can be unlocked and seen in the Extras gallery after the player beats the game on Hard Mode. This artwork shows that the shop was originally going to be called Funky's Flights like Funky Kong's business in the original Donkey Kong Country. ↑ GameXplain (April 5, 2018). Who Replaces Funky Kong When Shopping in DKC: Tropical Freeze for Switch? + World 1-2 Gameplay (PAX). YouTube. Retrieved April 5, 2018. This page was last edited on January 27, 2019, at 02:45.